Hi all. I just received an email back from the owner of Comico IV (the older grayer brother). Apparently both Comico IV and Comico VI have been tested and confirmed heterozygous gray! Here are the other links about this family since I feel bad raising the threads from the dead. Plus I don't know if I could pick which one to post in. O.o' http://equine.colorgenetics.info/content/weird-andalusians-whats-going-h... http://equine.colorgenetics.info/content/it-all-rabicano-or-he-going-grey http://equine.colorgenetics.info/content/remember-comico-vi Just an idea, but it seems that both stallions only sire "normal gray" offspring out of "normal gray" mares. While in Comico IV's case he has been proven to pass on gray in his one offspring Despina who don't appear gray and seems to have the same gray suppression he has. It appears that they haven't yet passed on gray without the suppressor. The 2 Comico's still don't have many foals on the ground, but it would be interesting if this pattern continues. If it does I think that the suppression trait may be linked to the gray gene they inherited from their sire Devoto II. I don't think Devoto II expressed this suppression because he is likely homozygous for gray (all grays 5 generations back) and this may have overridden the suppression effect. Here is a pictorial family tree for sanity's sake. http://i872.photobucket.com/albums/ab283/talkingmongo0se/ComicoFamilyTre... Also, I personally suspect Despina is wild bay. She did test positive for 2 agouti alleles and only one is At (Brown)so At is being overridden by the other dominant agouti. She also has a chestnut parent (like all the other wild bay horses out there :P) who could have easily hidden wild bay and passed it onto her. Since her sire is a common bay he could have easily hidden and contributed the Brown (At) allele. Plus Despina's flaxen mane and tail can be explained by the fact that her dam is flaxen, so the genes for flaxen are present and likely allowed to express through the restricted black pigment in her mane and tail. Sorry for the rambling. What do you guys think? Awesome, I remember reading that the one Comico tested grey AND that Despina did as well, that's awesome that both brother's tested it. I'm still going to vote that Despina is special, possibly related to this weird grey suppression. What do you think about this guy: http://www.tintagelandalusians.com/sales... ? Color is a little off to me - he was tested brown, but no mention if he was tested for grey. At this point the other colt seems to have at least a 50/50 chance of having the weird gray. He looks kinda sun-bleached in the later images but at this point anything is possible. The crazy thing is that we might have to wait a decade before seeing any signs of graying if they aren't tested for it first. After looking back you could be right about Despina. I don't know how I missed this before but Comico IV only has one agouti allele and Debujada has two agoutis and one is brown. Comico's agouti hasn't been defined as being brown or common bay. He looks like a common bay. His older brother looks like he could be brown. Sadly both Despina and her dam Debujada have been sold, so no idea where they are or where to keep an eye on what they produce in the future. I know this is an old thread, but I now own Ferrando, and it looks like he is getting some white hairs around his flanks. He seems to get more as he gets older (I used to work at Tintagel, and have seen Comico VI) I will post some photos in the spring, he is a very odd color. The photos of him are not really bleached out, he looks like that with his summer coat. I would be happy to keep you guys updated with photos of him, and I know where a couple of his siblings are. Elisabetta seems like she will be the exact same color as Comico. I have her owner on facebook, and love to see her grow. Thanks for sharing! This is going to be awesome. That would be great! Is it possible that anyone who owns horses from this line would be willing to get their animals tested for the gray gene? Oh, yes please keep us updated and welcome to the forum! What does the test cost? I would be willing at some point, just have a ton of stuff to fix on my car, so I won't have extra cash for a while. Ferrando's full brother Georgio is grey, and he has shown normal signs of greying since birth....interesting that the others are so different? Would love to help find out why. I will ask Elisabetta's owner about posting some pics here, and possibly testing for the grey gene as well. I am not in contact with Despina's new owner, but I know where she is, and could dig more in the future. I can find Prince's as well, I think I might have her on fb too. I would love to find the person who bought Comico VI. He was one of the most amazing horses I have ever seen. He is still being used to compete, but I don't think they stand him for stud? Okay, enough rambling...lol. This is just really interesting and exciting. That would be awesome if you could hunt down Despina and Comico IV. The test for gray from UC Davis is $25. I have a hunch that since Georgio is a heterozygous gray that he inherited his copy from his dam (a normal gray) and not Comico VI their sire. From what I've seen so far (mind you it's a small sample and this is all just assuming) the suppressor the Comico's pass on seems to be closely linked to their gray gene. They so far have yet to sire a normal looking gray out of a non-gray mare. If Ferrando does test positive for heterozygous gray I'd say his copy would have come from Comico along with a linked suppressor gene. And he is very cute by the way! I know Comico VI, but not IV...VI is the one I want to track down. Ferrando, Prince, Despina, Georgio and Elisabetta are all Comico VI foals. There was also a nice little foal by him out of an oldenburg mare, she was a bay, but was a weird color. She was sold before pictures were posted. Pretty little thing. So, since Ferrando's mom is also the grey mare, would that affect his results? How could we tell which parent it came from? Once I have Ferrando tested, and get his results, I will e-mail Despina's owner and ask if they would be interested. Oh and if you are interested, Susannah is a Dibujada baby by Diego, she is on the Tintagel site if you are interested in checking her out. I am also looking to find Dibujada's owner. I loved that mare and helped start her. Put her first couple rides on. ^ Are these horses you are trying to find the owners for ANCCE registered? Would be easy to find current owners. I am not sure, I know Comico VI was imported from spain originally, but he is PRE Mundial I think, is it different? The foals are all IALHA. I have only dealt with IALHA, but I have been looking into the PRE reg for Ferrando. We need to get a research group to look into these horses. There are also apparently some Mangalarga Marchador horses who appear to have the same suppressed gray going on but I don't think any have been officially tested. They share a genetic background with Andalusians so it is likely the same thing. Lesli Kathman had a post on her blog about them and has pictures. And unfortunately FM, we can't really tell if a heterozygous gray's gene came from the sire or dam if both parents carried the same mutation. But the fact that both Comicos' gray seems to be passed on with the suppressor, this would likely give us a clue if Ferrando tests gray that it likely came from his sire. WARNING unproven genetic theories ahead: Devoto II the Comicos' sire looked like a good candidate for homozygous gray given his pedigree and how completely he has grayed. If the suppressor is linked to the gray gene Devoto II likely passed it on to both his sons since they are both heterozygous gray. I'm wondering if the suppressor is overidden when gray is homozygous causing the animal to gray normally. However, I have yet to see what color their dam Humorista is so it could have even come from her if Devoto II isn't homozygous gray. Give me the names of the horses you are trying to track down, I will check ANCCE for you. Last recorded owner for Comico VI is Veronica Fraser-Harris. There is no "Calaf" registered with ANCCE and neither is "Despina". That pedigree is interesting. It shows that Humorista II the Comicos' dam was Bay. But back in her pedigree her sire's dam, a gray, came out of two bay parents. It makes me curious even though one of the parents may have been registered as a foal before graying at a normal unsuppressed rate. WOW. I would want to see if they would be willing to gene test the sire to confirm if he really was gray! May be totally correct but further research would definitely be needed. The sire Agente is for SURE bay. 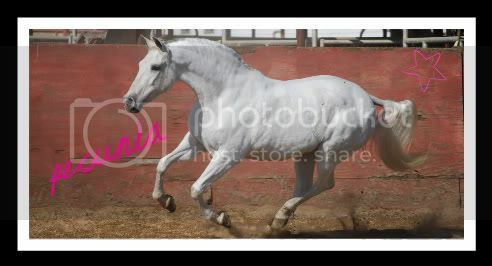 He is a famous Yeguada Militar stallion. Wondering if the weird Comico color is coming from the top half because the bottom half is all Yeguada Militar and Bocado breeding. We do a lot of breeding with these lines and have never seen anything out of the ordinary. The mare in my signature is Yeguada Militar. She is a daughter of the immortal Leviton (sired by Agente). You will see it happens a lot. Here is Pecunia's pedigree. Destinado VI and Estepena are both registered bay but supposedly produced a grey. She also has the same mare from the breeding questioned above. Here is a Mangalarga Marchadore, bearing a stunning resemblance to one of the Comico stallions! Oh man, that's amazing. Good find! Lesli Kathman has a whole post on him and others with this trait as well. Shows that Unico's other family members had it too. With the Comicos, the Connemara and now this Mangalarga Marcadore there are 3 breeds with Spanish/Portuguese ancestry showing a similar modifier (?) of gray - only the American Saddlebred falls out of this picture... but then that horse was not tested for gray or was it? Saddlebreds could easily have Spanish influence somewhere way back in the lineage. All American breeds are very recent developments comparatively. I think here are some more with that weird greying process - unless you can tell me that it is normal to have the head grey only at 3 or 6 years old... I have never seen that before at least. Somebody with more grey-experience here? no age given - long yearling? Not that unusual IMO. Graying usually starts at the head and thus it gets the lightest quickeset. Some are a bit more extreme than average, but none out of "normal" range IMO. For those who were wanting to follow the Comico family of inheritance, Despina was sold to Australia. Despina was not sold to australia. One of the other babies from Tintagel was exported, by the same people. Despina is in florida. I was there when she was sold. Ferrando is shedding out with a bunch of white hairs in his flanks, can't wait till he is done!